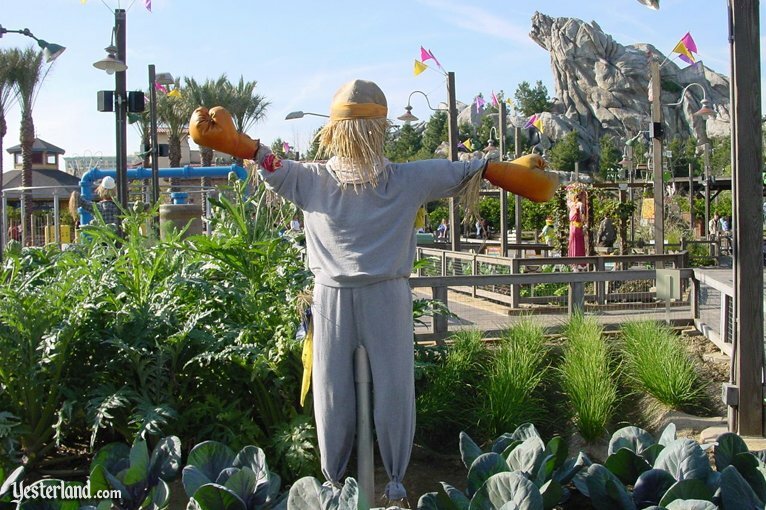 Other theme parks have attractions with pirates or submarines. 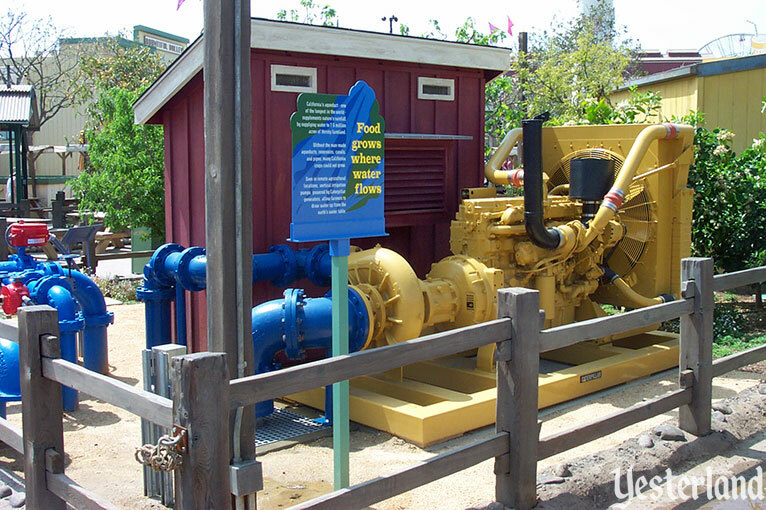 But where else can you find an attraction with full-size farm equipment? Admire the many crops growing here. 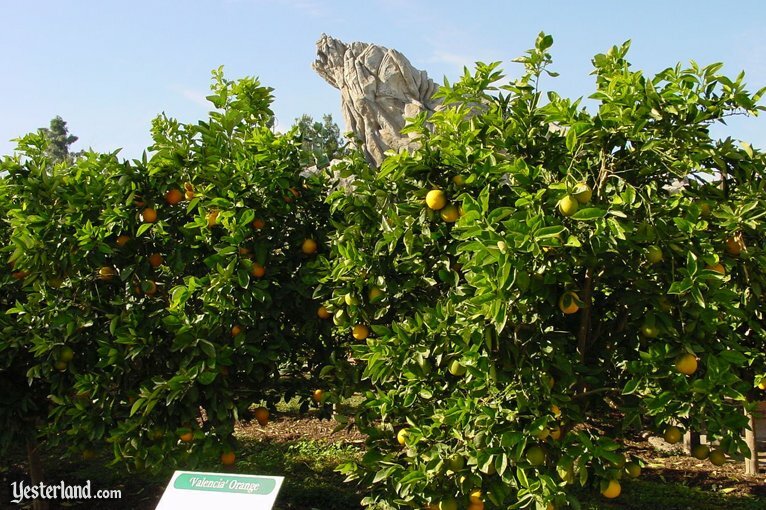 California is the nation’s number one farming state, and this area provides a sample of the many crops that grow in the state’s sun-drenched, fertile valleys. 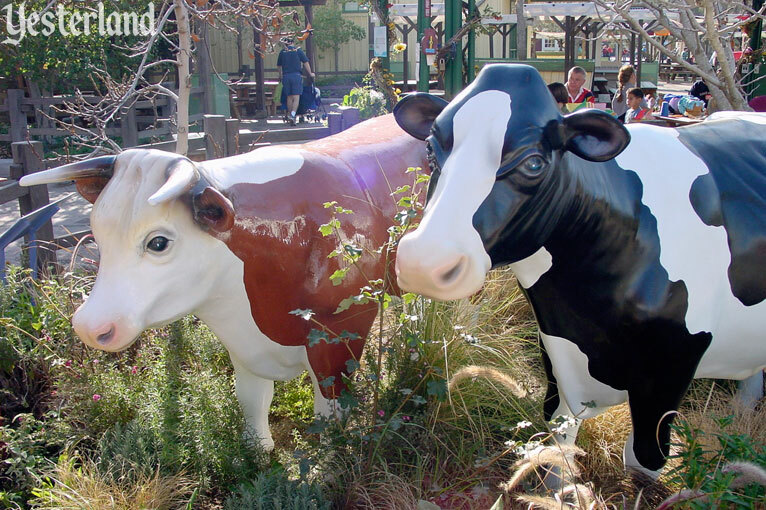 “Since the first herd of BEEF cattle was ‘moo-ved’ to California in 1774, production of cattle and calves has become the 4th most valuable farm product in the state. There’s another liquid that’s even more important than milk—that’s water. Not only can you learn about irrigation, you can cool off in the Irrigation Station water-play area. But you didn’t come here to see plants, animals, or water systems, did you? You came for the exciting part of Bountiful Valley Farm—the tractors! “At the turn of the 20th century, two of America’s most innovative tractor makers—Benjamin Holt and Daniel Best—were both based in northern California. “Though California is home to some of the nation’s most fertile farmland, traditional tractor wheels of the 1900s often got bogged down in the state’s soft, sandy soil. Holt responded by developing tracks to replace tractor wheels. “The tracks spread the machine’s considerable weight over a greater area, allowing California farmers to cultivate the wet soil along steep hillsides. 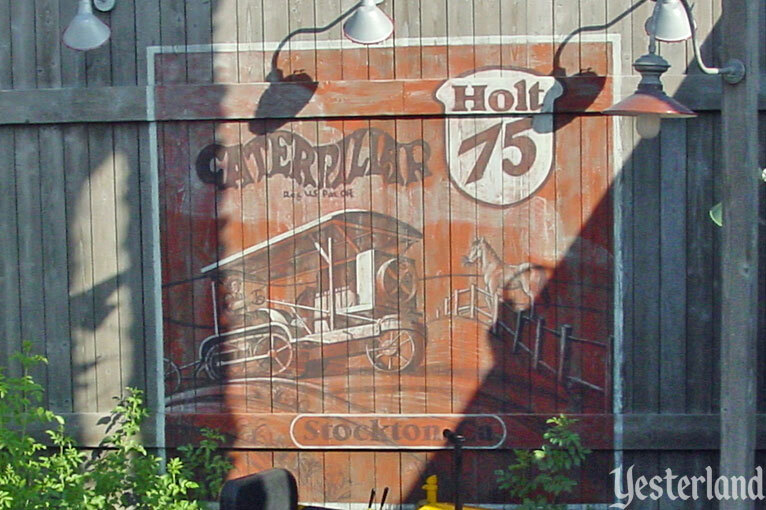 “In 1904, a spectator inadvertently helped name the Holt 75 when he remarked that she crawls along like a caterpillar. 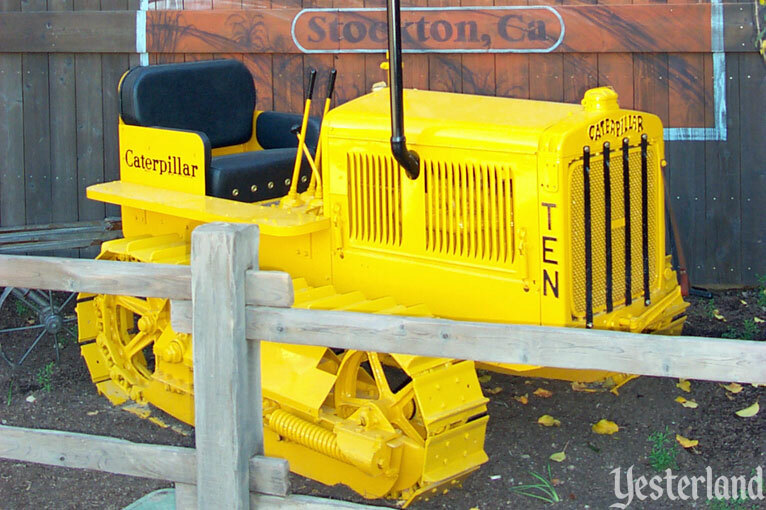 Now that you’ve learned about the history of Caterpillar, take a look at three current models. Sorry. You can’t go on a tractor ride. But you can admire the equipment in all its bright yellow glory. And, in one case, you can even climb into the cab. Walk up the stairs behind the Challenger 95E and climb into the cab. Take a look at the sophisticated controls and monitors that farmers use these days. With all the controls, it’s more like a cockpit than a cab. 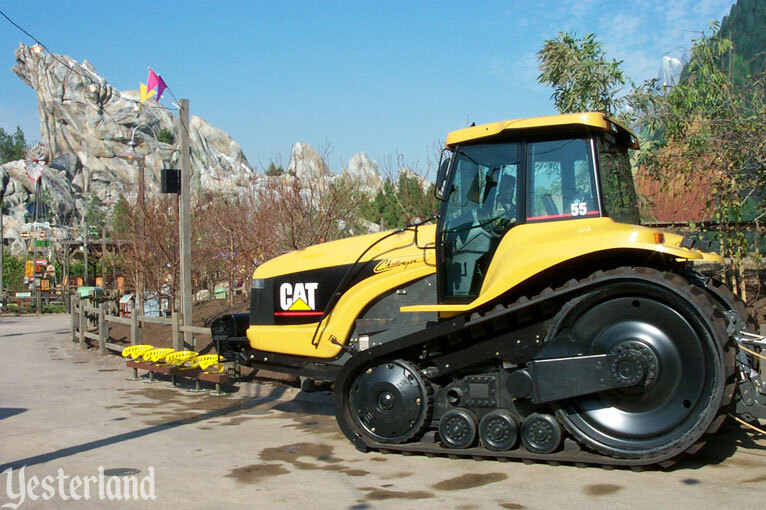 Here at Bountiful Valley Farm, you’ll learn that Caterpillar farm equipment isn’t just for tilling soil. Pretend you’re an orange grower. How would you haul orange crates through your grove? 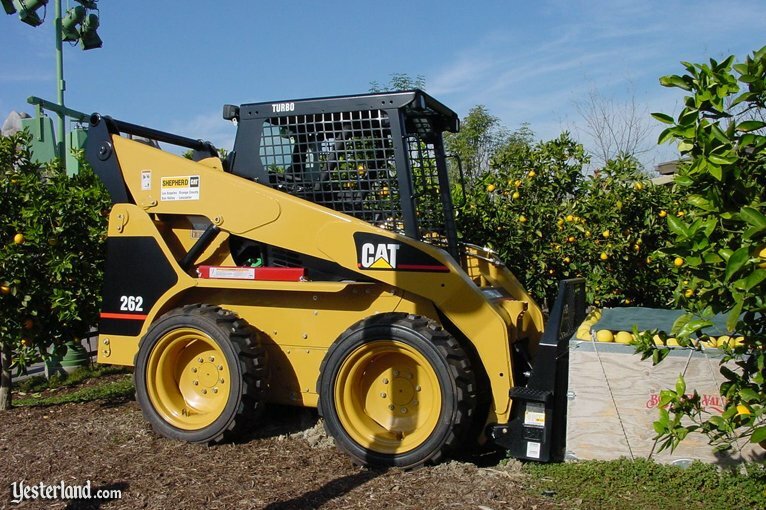 With a CAT 226 skid steer loader, fitted with forks to carry crates, of course. Other producers use Caterpillar equipment to haul feed and perform maintenance. Versatile, eh? 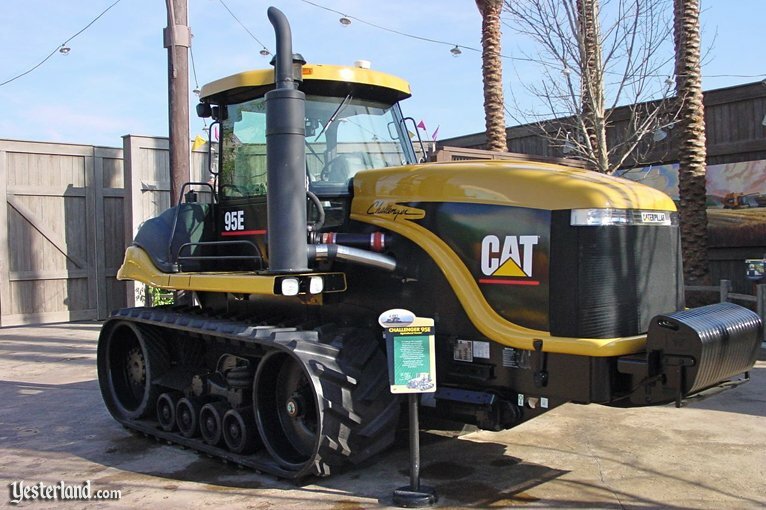 By now, you might be so excited by Caterpillar equipment that you want to take home a reminder of your visit to Bountiful Valley Farm. You’re in luck! 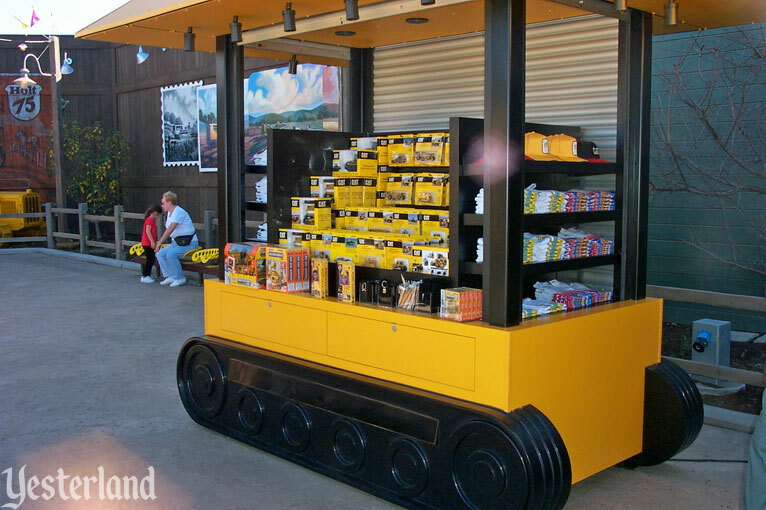 The Caterpillar Cart offers a fine selection of model farm equipment and other Caterpillar souvenirs. Want more? There’s an actual shop for you. Visit Santa Rosa Seed and Supply for gardening supplies, flowers, and plants. 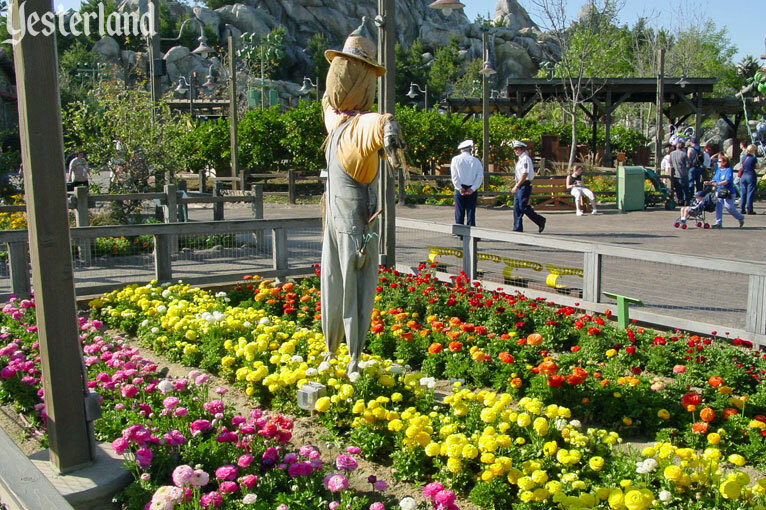 Bountiful Valley Farm was one of the original features of Disney’s California Adventure when the park opened in February 2001—one of nine attractions in the park’s Golden State district. 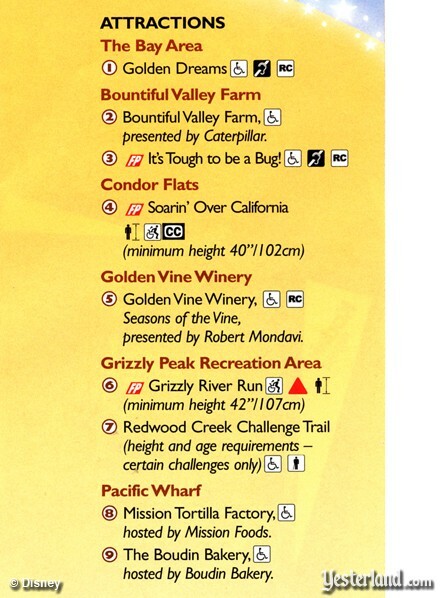 As the above scan shows, the name “Bountiful Valley Farm” referred both to a section within the park’s Golden State district and to an attraction within that section. In addition to the agricultural displays, tractors, water-play area, and gift shop mentioned in this article, the Bountiful Valley Farm section also included It’s Tough to Be a Bug!, a small entertainment stage, and two counter-service restaurants: Bountiful Valley Farmers Market and Sam Andreas Shakes (“delicious to a fault”). 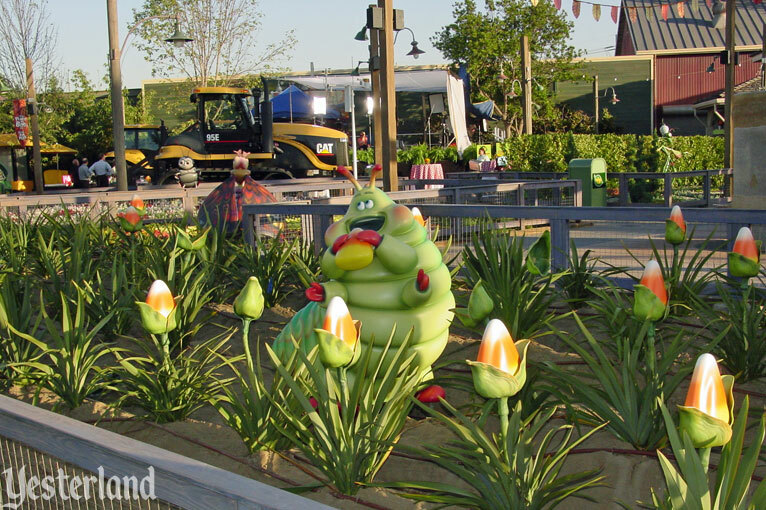 When A Bug’s Land opened in fall 2002 as a new district at Disney’s California Adventure, Bountiful Valley Farm became a part of that district, instead of being its own district. Bug characters from the 1998 Disney-Pixar movie A Bug’s Life moved in to the displays. Santa Rosa Seed and Supply became the P.T. Flea Market. 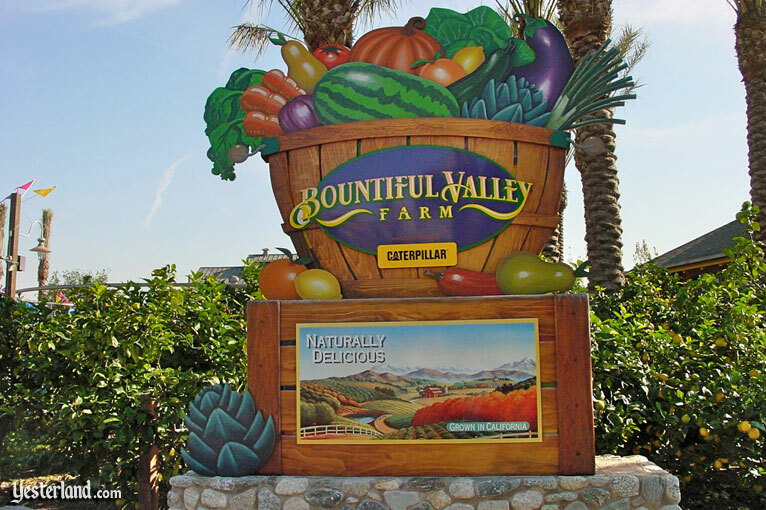 Caterpillar continued to sponsor Bountiful Valley Farm until late 2006. When Caterpillar left, they took their tractors with them. Bountiful Valley Farm closed forever on September 7, 2010. Construction walls went up. Perhaps there was Caterpillar equipment behind those walls—but only for demolition and site preparation. For centuries, mankind has been toiling to turn deserts into verdant farms. 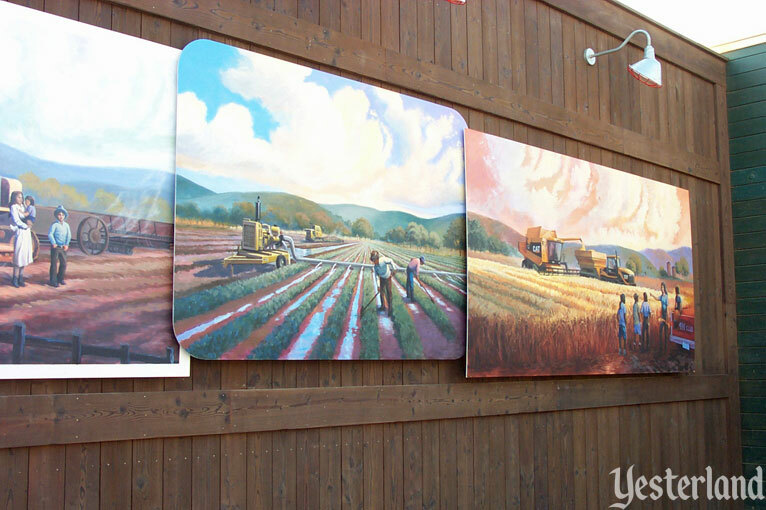 But at Disney California Adventure, the farm was turned into part of a desert—and most Disney park fans are delighted. 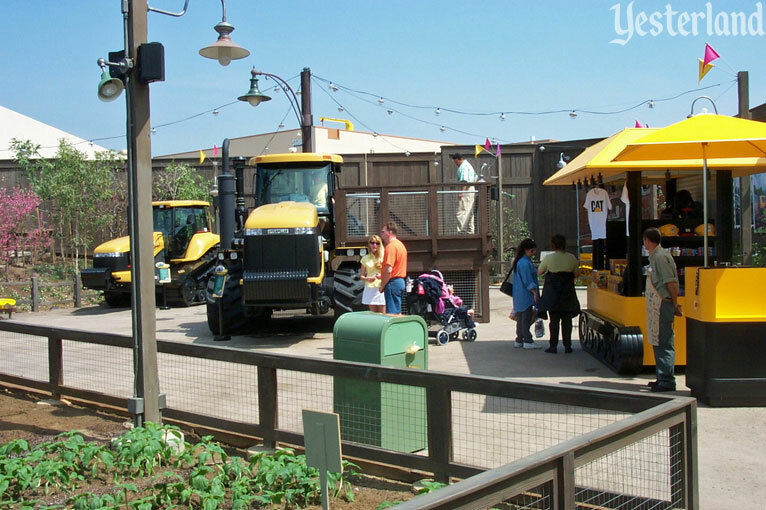 As part of Cars Land, there are tractors just a few steps from where the old Caterpillar tractors used to be. 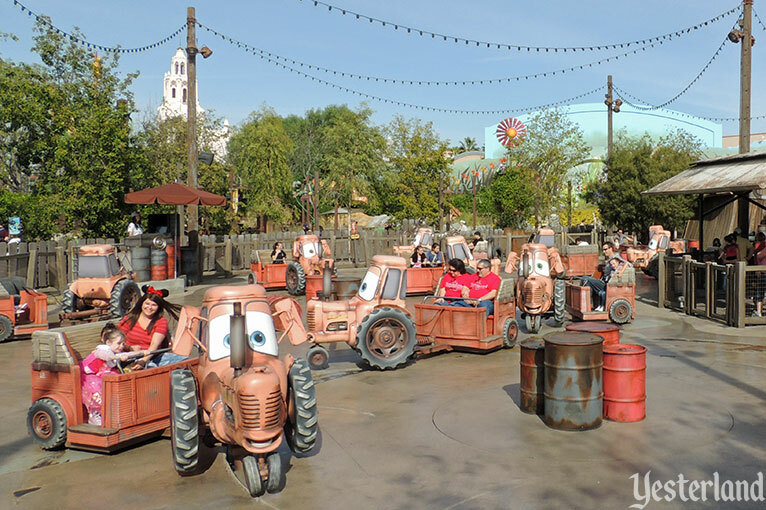 Mater’s Junkyard Jamboree may not be as educational as the Caterpillar display—but it’s a lot more fun.